Barboach in game: 5,789 Who? Important notice! Pokemon Barboach is a fictional character of humans. 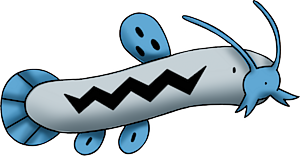 Barboach is a small, serpentine Pokémon that resembles a loach. The main body is a soft gray with a jagged black line running its length. Its eyes are very small, and it has a round, blue nose. It has several blue barbels that are used as a superb radar in murky water, and can be used for taste as well. These whiskers are left exposed when it hides in the mud to wait for prey. There are two rounded, blue pectoral fins and a single dorsal fin, all of which have black spots. Its tail fin it also rounded and blue, but possess no spots. A slimy film covers it and protects it from bacteria and allows it to get away easily when grabbed. If it does not stay moist, it dries up and weakens. Because of this, it is usually found at the water's edge if not in the water. Barboach was going to be featured in an episode between Solid as a Solrock and Vanity Affair. However, the episode never aired due to an earthquake that occurred in Japan sometime before its scheduled airdate. The episode hasn't aired since. Barboach made its official debut in The Great Eight Fate! 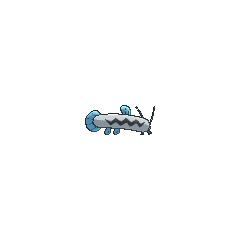 as one of the Pokémon that Juan used for his water show in Sootopolis City. A few wild Barboach were seen in the wild in On Olden Pond! Multiple Barboach were owned by a family of traveling circus performers in Pokémon Ranger and the Temple of the Sea. 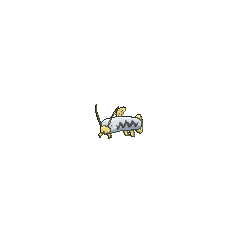 A Barboach appeared in Strategy Begins at Home! while Team Rocket was fishing for Goldeen. 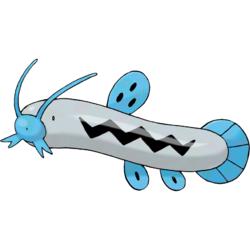 Barboach has appeared in aquariums belonging to Mr. Briney and Team Aqua, but unlike its evolved counterpart, it has not played any major roles.